Weekends BC (before children) consisted of late morning starts followed by a calorific brunch with endless cups of coffee to recover from the previous evening out. Imagine the rude shock and adjustments we’ve had to make with the arrival of children who eat up any adult leisure time that we previously enjoyed! 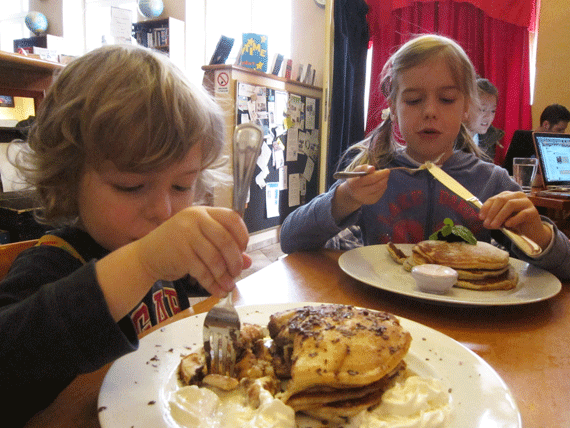 Now we’ve hit on a compromise, Sunday visits to the Globe Bookstore & Cafe for an American style brunch combined with a 2 hour Storytelling & art session hosted by Lilly & Victoria. 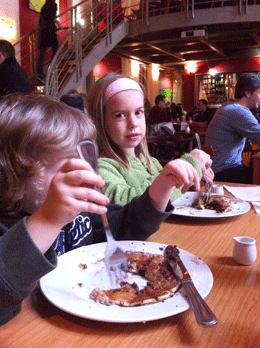 Happy kids, happy parents; reclaim your lazy weekends! The kids and I have been twice now, first with a friend and her two daughters (3 & 8 years old) and then with my husband. Both times have been enjoyable and the children have been well entertained allowing us maximum time to catch up and enjoy a good sit-down meal without disruption. Heavens, we even managed to knock back a few glasses of vino too! 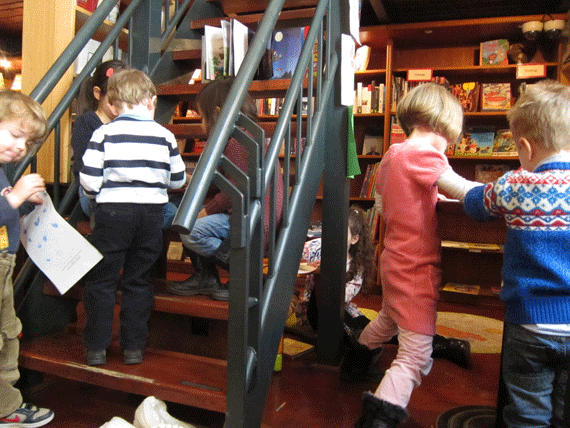 The storytelling sessions are from 11am till 1pm in the bookstore area out front. Here you’ll also find a couple of large tables in the entrance as well as a couple of smaller tables tucked in amongst the book shelves. It’s possible to reserve these tables so if you have younger children who are less confident with strangers then this is probably the area to be seated. Luckily for us our kids are a little older (7 & almost 4) and have no problem being some distance from us, so we are able to sit in the cafe area at the back. Once they note where we are sitting they quite happily join the group and then come visit if they need anything. So every Sunday (except holidays) Lilly or Victoria host Kid’s Storytelling. 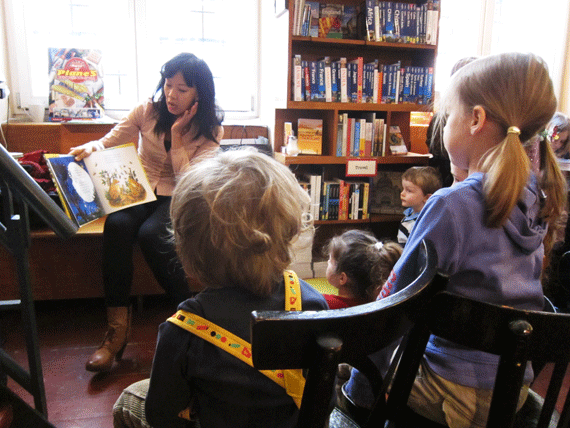 Several stories are selected from Globe’s children’s book section and often Storytelling has a theme - Easter for example, and children are also encouraged to pick a book that they would like to hear. It’s a casual affair, chairs and pillows are set up under the window and the Storytellers work their magic. Both girls are professional Actresses and met through Stage Stars. Lilly’s background is in theatre, film and television (including voice overs) and she also has taught drama to children. Victoria has a strong background in broadcasting and used to work for the BBC. So their presentation, annunciation and tone are dramatic and engaging when creating the various characters within a book. The children listen with interest and the girls ask them questions making them respond to the storyline and the illustrations along the way. Lilly loves the chance to do all sorts of silly things that children find cool and entertaining so it’s a fun time for her as well as the kids. There are pauses for creative expression - usually colouring in sheets and cards, sometimes other simple craft projects are introduced. The kids find a spot on the stairs, the floor or a table to create their masterpieces and then it’s back to another story. The ideal age range would probably be from 3 to 8 years, depending on your child. Parent’s have the option of sitting with the group (nursing a coffee) if their child is apprehensive and the children are free to come and go from the group as they wish. Our kids came to our table to have their pancake brunch during storytelling and then happily returned to the group once they’d finished. Globe’s Sunday Brunch runs from 9.30 to 4pm. If you are ordering for kids, don’t forget to ask for their children’s menu, most of the kids meals are 85czk and adult dishes average 135czk-190czk. Prices for the brunch are not the cheapest but it’s a diverse brunch menu and casual american-style brunches are hard to come by. 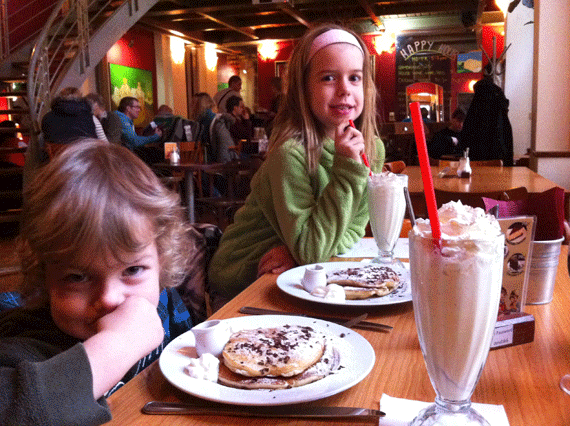 Our kid’s have a complete sugar hit with vanilla milkshakes and chocolate chip pancakes, I can’t believe that they’ve made it through that order twice now! For me, I opt for the French Crepes over the Pancakes - if you like thin pancakes instead of thick ones then the French Crepes are the way to go. To burn off the sugar hit, head to the playground on Zofin Island or if you’re going in the direction of the centre go to the Františkánská Zahrada playground. 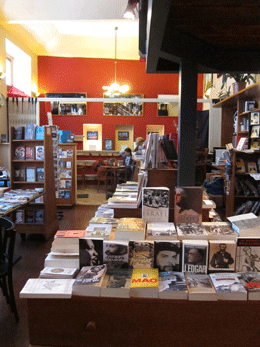 The venue is non-smoking and there is free WiFi as well as a range of local and international newspaper, magazines and (of course) books for sale. Storytelling Sunday will continue each Sunday until the end of the school year. 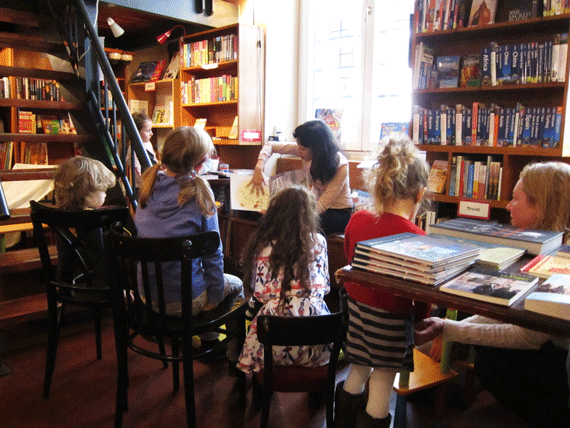 During the school holidays Storytelling Sunday will probably be just once a month - TBC. DIRECTIONS: By Tram: Tram numbers 21 or 14 to Myslíkova or tram 6, 9, 18 and 22 to Národní třída then walk down Ostrovni till you reach Pštrossova. By Metro: Take the yellow Metro B to Karlovo náměstí (or Národní třída when it reopens). By Car: The cheapest car parking is at Zofin Island (30czk per hr), across the street the parking at Narodni Divadlo is 50czk per hr, there is also some paid parking spots in Myslíkova so on weekends you should be able to park here for free.